Well-funded strategic safety systems and major safety improvement initiatives are falling short of corporate expectations. In many instances, they are failing dismally. Building Safety Commitment aims to turn this trend around. The 21st century has given us cutting-edge tools and increased knowledge for improving safety, such as high-tech personal protective equipment and more effective management systems. However, investments in the best flame resistant clothing, air-purifying respirators, and chemical resistant gloves are only useful if people make a commitment to wearing them. Similarly, expertise in proven leadership practices can help you be a better leader but again, they are only beneficial if you make a commitment to use them. Behavior-based safety processes have been proven effective in reducing incidents and injuries but their effectiveness also requires an essential ingredient: commitment. Commitment is a critical contributor to safety programs at all organizational levels. For optimal performance, front-line employees need to commit to following through on their training and wearing PPE, while managers must commit to overseeing the safety process and promoting safety as the key organizational value. In fact, if you take close look at industry research, it is clear that those leaders who commit to the stewardship of the entire safety process have the most impact on safety performance. 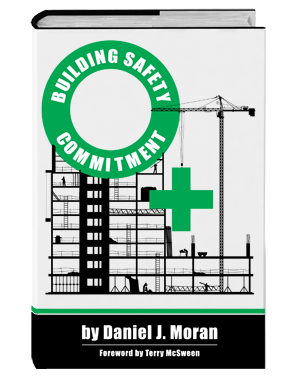 Dr. Moran’s new book, Building Safety Commitment, discusses proven ways of increasing people’s dedication to safety in the workplace. Dr. D.J. Moran is Founder of Pickslyde Consulting, and Senior Vice President for Quality Safety Edge (QSE). He earned his Ph.D. in Clinical/School Psychology from Hofstra University. D.J. has 20 years of experience applying behavioral principles in clinical and business environments and has developed an innovative approach to building leadership commitment to safety improvement. As a Board Certified Behavior Analyst, he has conducted safety improvement initiatives in a variety of industries including pulp & paper and petroleum with organizations such as the Kuwait Oil Company, Tennessee Valley Authority, and Boise Paper. He also engaged in leadership training in Sierra Leone, and in several U. S. companies. His specialties include applied behavioral analysis, organizational behavior management, government consulting, Acceptance and Commitment Therapy (ACT), leadership consulting, behavior-based safety (BBS), innovation training, sales coaching, and executive coaching. D.J. is the past president of the Behavior Analysis Society of Illinois. He has served in elected positions for the Association for Contextual Behavioral Sciences and other national and state organizations and is the founder of the MidAmerican Psychological Institute in Chicago. An interest in obsessive-compulsive disorder led him to work with individuals dealing with compulsive behavior. He has appeared on or been a part of several television projects including Hoarding: Buried Alive (The Learning Channel), Confessions: Animal Hoarding (Animal Planet), and FOX News broadcasts. D. J. coauthored ACT in Practice, a professional book focused on complex, applied behavior analysis and is the author of numerous papers on behavior change and evidence-based education. He has spent the last several years combining ACTraining with behavior-based safety and executive coaching for leadership. This website offers free tools related to Building Safety Commitment.